Because We Care, our Operations Division is dedicated to responding to incidents involving emergency medical services, fire, hazardous materials, water rescues, trench rescues, confined space rescues, high and low angle rescues, building collapses, transportation accidents, unsafe conditions and public assistance to prevent injury or property damage. Being prepared at all times with the proper equipment, appropriately trained personnel, and stations in the right locations are critical to accomplishing the Department’s mission to serve. 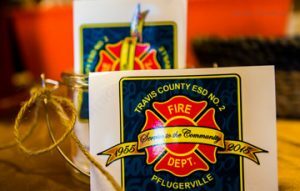 The Operations Division is the largest division in the Travis County ESD No. 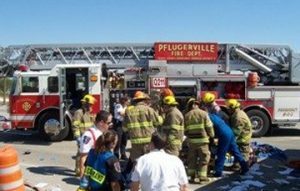 2 / Pflugerville Fire Department with responsibility for emergency medical response, fire suppression and protection, and disaster mitigation. Under the direction of the Assistant Chief of Operations, the division operates out of five companies of sworn personnel working a 24/48 hour rotation in four stations assigned to apparatus consisting of six engines and three trucks with a Battalion Chief assigned to each shift. Well trained, physically fit personnel are vital to our Operations, and with a strong commitment to serve the community, we continuously evaluate, plan, coordinate, and provide appropriate training and development for fire and rescue as well as emergency medical response. To learn more about how firefighters prepare for emergencies, visit our Training page or click here. Visit our Response Gallery or click here to see our personnel in action.